On a regular basis, Bob Denney puts himself and his judgment out there and predicts what will be the coming year’s hot—and cold—law practice areas. He recently did so again, and I encourage you to read his prognostications. Social media. Continues to be far more effective for building individual lawyer reputations than for firms. Competition. It’s no longer just from other law firms. It’s now coming from two other directions: Non-legal business entities like LegalZoom and, for large firms, more and more from the clients themselves who are using their legal departments as well as alternate service providers. Cybersecurity. While many firms have developed plans for reacting to a cyberattack, many more have still not developed or implemented cybersecurity plans to prevent such attacks. One overlooked factor is what actually constitutes a breach. Some firms regard any unsanctioned access of a firm system as a breach, while others do not regard it as a breach until something — data, files or money — has been taken. Scamblogging. A category of online writing by debt-burdened law school graduates who are convinced their law schools misled them about their opportunities for employment. What’s growing in your law practice? If it’s a niche or topic that surprises you, please write to me at arizona.attorney@azbar.org. Data + lawyering? Yes, say Clio. Was it way back in December that I wrote about the new Clio law practice report? And promised you more? Yes, it was in the December issue of Arizona Attorney Magazine that I chatted about the Clio Legal Trends Report. You can read the column here. Because I’m super-helpful, I’ve pasted in below what I wrote, so you don’t even have to click. We thought we understood the way the world worked—and then the Cubs won the World Series. I suppose it’s good we’re still capable of being surprised. It probably says something nice about our capacity for joy. Or something. Of course, surprises are not always happy, which occurred to me as I read a new report on law practice trends. Via their “Legal Trends Report,” the people at Clio—the cloud-based practice management people—want you to know two things about your law practice. First, your practice is a funnel—one that may be malfunctioning. And second, consider using data—actual facts based in reality—to drive your practice decisions. Clio will likely say I’m oversimplifying a vast array of takeaways from the report released in late October. But those takeaways—and the underlying facts—are pretty stunning. Here is a link to the complete report. Read it yourself and let me know what you think. The average rate billed by lawyers across the United States is $232 per hour. The total utilization rate (billable hours as a proportion of hours available in a working day) for lawyers in 2015 was just 28 percent. For solo lawyers, that number drops to just 22 percent. They can see, moment by moment, how many new matters are opened, how many invoices are generated, how many remain unpaid. Does this spell the end of surveys based on self-reported data? We’ll see. The second takeaway is related to the unprofitability of many attorneys’ law practices. When we look at just two of Clio’s many charts—Arizona’s average hourly rate, and its (gulp) average collection rate, the situation appears dire. There’s definitely more to the picture. But as we head into 2017, we will seek ways to tell the true story of law practice challenges. Time to get your Boolean search skills up to snuff, with Fastcase. 1. On Thursday, Oct. 20 (10:00 a.m. MST), Fastcase offers its “Introduction to Boolean (Keyword) Searches (2016),” which is part of your legal research member benefit. Mobile + lawyering? Yes, say Clio. In the upcoming issue of Arizona Attorney Magazine, you can read a follow-up to a great panel discussion on selecting the right law firm model to match your approach and expectations. It was hosted by David French and was a great way to assess your own practice. I hope he continues to hold similar roundtables. As you think on those law practice issues, consider a webinar tomorrow that examines niche practice as a source of satisfaction and profitability. It’s hosted by two smart people, so my confidence level is high that attendees will gain a lot of value. Clients are no longer seeking lawyers with broad skillsets and general knowledge, but rather experts who focus on a unique industry and specialize in the laws that surround it. Now more than ever lawyers need to abandon the “any case that walks in the door” approach and start a niche practice in order to grow their businesses and find success. 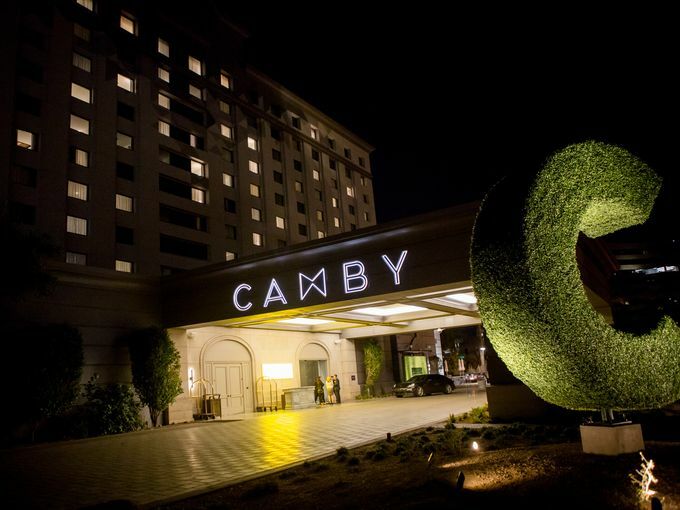 The Camby Hotel in Phoenix will be the site of what looks to be a valuable lawyer roundtable on Thursday, May 26. We routinely consider the modern challenges that face attorneys and their law practices. But those challenges vary considerably depending on your practice type, firm size, and client base. That is part of the strategy behind a roundtable discussion this Thursday evening, May 26. Attorney David French, who is also a broad thinker about the legal economy and legal future, will moderate a group of lawyers from diverse practices. 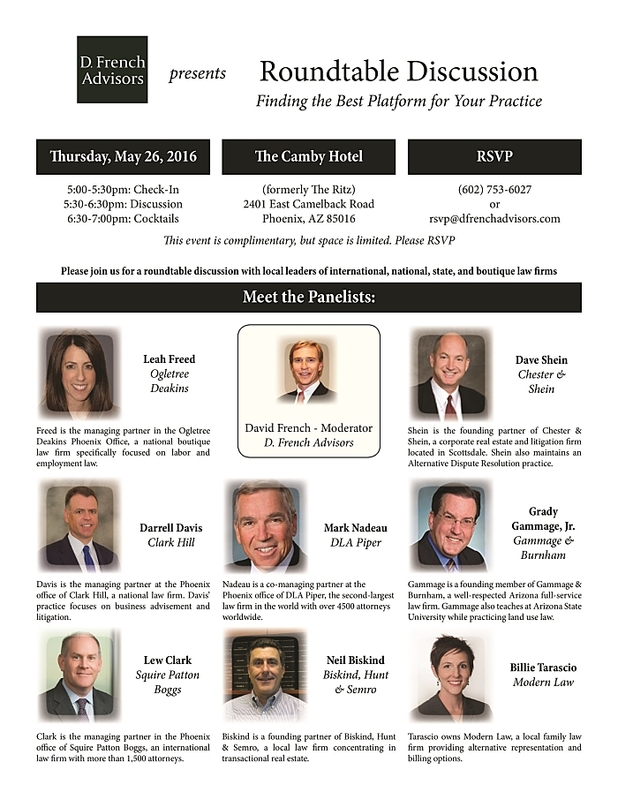 Gathering starting at 5:00 pm at the Camby Hotel in Phoenix, participants range from those in global law firms, to regional (southwest) law firms, to primarily Arizona operations, and even those who have crafted profitable practices as small firms. RSVP to 602-753-6027 or rsvp@dfrenchadvisors.com. I’ll be there on Thursday evening, and I hope to see you too. One place for all the practice tools a lawyer could need? That’s what the New York State Bar Association has developed. I just flew in from New York, and, boy, is my brain tired. Previously, I wrote about a conference focused on criminal justice that I participated in last week. Hosted in the Big Apple, it brought together great people and some legal luminaries—like Judge Jed Rakoff, U.S. District Judge for the Southern District of New York. I plan to tell you more about the symposium soon. But while I was in that great city, I was thinking about a terrific product, recently launched, that benefits attorneys all across that state. So today, let’s talk about a unique hub that gathers together tools and products that are most useful to practicing lawyers. If I were running the show, I’d aggregate all those tools in an easy-to-use app-like interface, one that remembers me, the individual user, whenever I’m logged on, and one that looks cool, operates fast, and thinks about what I need before I do. And I think I’d call it a lawhub. Or maybe a LawHUB. Which is precisely what the New York State Bar Association did this year, when it rolled out its innovative LawHUB. Smart folks there. You can read more about it here, where the NYSBA put out the news. And here is the page where their members get started. Interested in more? One of the deepest dives available to us nonmembers is on this informative About page. Let me know what you think. Long term, it’s possible the New York State Bar may be seeking to license this platform to other bars and associations. Would this kind of online structure assist you in your law practice? And in the meantime, congratulations to the smart and innovative folks at the NYSBA!